I've been over at the father's again. The monthly visit. Originally intended for six days it became nine. These visits grow ever more 'fluid' as his needs rise or if Mac1's time has interfered with her own ill-health. Poor thing went down with a very bad throat this time. The visit was not without its issues, as the post yesterday and today's title might indicate. I could say it was only him. However, the truth of the matter is that there was something of these in myself too! Father's is due to the toll which Parkinson's is taking upon him and his life-long habit of not talking. If one measures it just right, there are glimmers - briefest of moments - where there may be several sentences of conversation directly related to the case. Mostly though, nothing. Any attempt by the daughter to open things up caused fraught tension, feisty responses and then frustrated silences. There was only one point where I had to take myself to the other end of the house and get stuck into a book. Generally, I am very even-tempered, so as much as anything, I was frustrated with my own lack of patience at the rebuffs. However, the visit, on the whole, was as enjoyable as these periods usually are. We had poetry sharing (father has a phenomenal memory and breaks into recitals without any warning! ), shared television of nature shows, antique shows and murder mysteries, and I made soup. Lots of soup. It goes down well on restricted oesophageal tracts. Ohhh good thing you are practicing up before going to OZ. I understand your struggle with patience as you are probably doing as I used to do with my parents.. repeating lots of the same things. Daddy mostly due to NOT listening/hearing and refusing to wear hearing aids which made patience harder because it was avoidable for the most part. When the going gets tough, the tough make soup. Lots of it. Comfort food for sure. Hope Mac1 is feeling better soon. Do you think there is some generational reasons for your father being of few words? Even if it frustrated I bet your dad love having your company? I liked that comment by Forsythia: When the going gets tough, the tough make soup. Good luck with the paternal and the new keyboard. Tough and oh-sop-common situation with your father. I have an impression that, if anyone can handle it, it would be you with your deep thinking and empathy. You are a good daughter to stay so long and make so much soup! 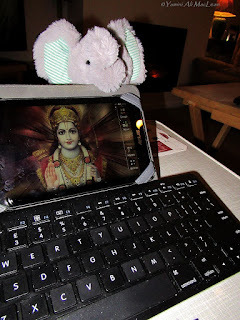 I hope that your keyboard is helping the blog situation :) Hugs. It was supposed to say "oh-so-common"... because I experience it too in this stage of life with my father. I understand - between his ignoring me all day while he watches sports on the highest volume available I can only do about 4 days at a time with my Dad. Less in the summer because he's always cold so rather than put on a sweater he opens up the doors and windows when it's 100 plus degrees out (no a.c. in the house). JB's step-father had dementia, only they didn't know it, as he seldom spoke. My dad lost his hearing aids, after he broke them a couple of times. It was difficult. I hear you.